"When the gun went off, I was full speed until I had nothing left." Bianca Knight is a proud mamma. Most days you can find the 30-year-old native of Pearl, Mississippi -- who was a member of the USA women's World Record 4x100 relay at the 2012 Rio Olympics -- taking care of her 3-year-old little boy, Prince, while she prepares for another on the way. She lives in Orange County with her husband. But Knight still finds some time for track and field. Her organization, the Bianca Knight Foundation, helps to raise money and provide grants for young athletes around her native state. 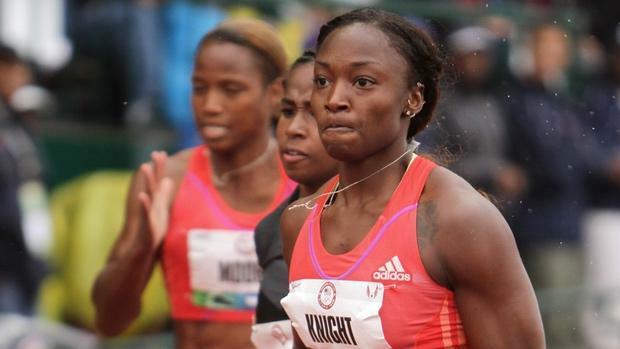 A former professional sprinter for adidas, in January Knight held her first coaching clinic in Ridgeland, Mississippi. She brought in professionals like Mike Rodgers and Raven Saunders, among others, to teach principles on track and field. "It was about educating people," Knight said. "That's what I do in my spare time now." Knight retired from her profession in 2016 when, she says, she was looking to focus exclusively on being a mother. "I could have done a lot more in my time as a professional, making teams and doing all those types of things," she says. "But it really wasn't my goal. I enjoyed running. I liked it, but it became a business and it was stressful. I started to not want to do it anymore and I wanted to start a family." "A lot of people ask me, 'Would you still like it if you were running?' And I'm like, 'No, I like watching it and helping other people with it.'" But she didn't leave without some serious credentials. The former University of Texas sprinter, who set an indoor collegiate record of 22.40 seconds in the 200m in the only year she competed for the Longhorns, was one of the first athletes in the country to accept a professional contract in her freshman year of college, and then she eventually racked up some impressive medals, helping the USA women to a gold medal at the 2011 World Championships in Daegu (4x100), a gold medal and World Record at the 2012 Rio Olympics and a gold medal at the World Relay Championships in Nassau (4x200) in 2014. Before Knight eventually helped set records and win gold, she set the nation ablaze in high school. One of her first big moments in the sport came in 2007 at The Simplot Games in Pocatello, Idaho. And to this day, 12 years later, Knight still holds the indoor national record at 200 meters. 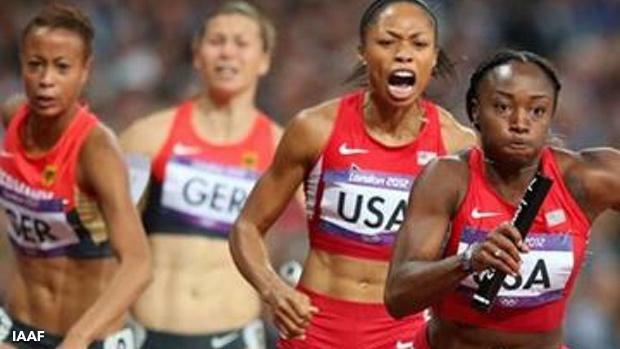 No girls athlete in history has been able to crack 23 seconds at the distance. Knight: "My high school track team kicked me off the team after the eighth grade." It was an unnerving early experience for Knight, whose entire family had graduated from Pearl High School. As a seventh grader, Knight was already running varsity for Pearl. But this unbelievable moment is in fact true. In Mississippi, Knight had been able to compete in track and field as early as the seventh grade. And she excelled almost immediately, winning an individual state championship off of pure instinct and talent. But Knight, who worked individually with a club team over the summer, ran faster during her competitions beyond the spring season -- and specifically at the USATF Junior Olympics from 2001 to 2005, she said. Pearl coaches apparently weren't fans when Knight, who tried to explain that fast times are corollary to the competition one sees on the line, failed to hit her PRs in the spring for Pearl as opposed to the summer. Knight: "They didn't like how I did so much better in the summer than I did during the school year. They didn't understand the amount of competition I would get over the summer. They just thought I wasn't trying hard enough, or I wasn't running fast for them on purpose." Heading into her ninth grade year, Knight realized she did not have track and field as her gym period, so she later talked to an administrator, who relayed that because she had run summer track the previous few months for her club that she was in fact off Pearl's High School team. Knight and her mother, Amy, spend a week thinking of what to do. Knight: "I remember my mother telling me, 'You're not quitting track, you're just going to go to a different school." About a week later, Knight transferred to Ridgeland High School. It was a 21 mile trip north from Pearl. Knight ran indoors for the first time in the sixth grade. Organizers in the state put on a meet in Jackson called The Magnolia Classic. Knight: "They would put a wooden track in our coliseum. Strangely enough, I got used to running on that thing. They had an all-comers meet, a fun run kind of thing, where they would invite people from all over. It was highly unorganized, but it was something where they catered to track and field, and so we did it." As Knight got older, she began to travel frequently to find better meets. Knight: "It would often be just me and my mom traveling. We went to the LSU Invitational in Baton Rouge and a meet in Houston and Arkansas and The Simplot Games and the Nike Indoor meet in Landover, Maryland." Knight: "I traveled pretty much my whole season." At a young age, Knight said she simply worked off feel. "A lot of times I ran off natural talent in high school," she said. "There was no technique or strenuous training. That wasn't what it was about. I just went out and ran hard." Knight was able to compete at the famed western meet three times over her high school career. But her first trip to Idaho didn't go as planned on the first day. Knight: "The first year was rough. My legs didn't come with me. "Then I realized you couldn't use your spikes the first day. I didn't have flats. So (an athlete I knew, his coach from Colorado) helped me out. He gave me a pair of flats. "I got to the finals, but I had to make it out of the slow heat. I still won the 200m out of the slow heat and the next day we ran in spikes. The following spring, Knight competed internationally, winning gold at the World Youth Championships in the 100m in Marrakesh, Morocco. And as a junior, when she returned to Simplot, Knight was considerably faster. She had no problem breaking 24 seconds in the 200m. In fact, she proceeded to run under 24 seconds on almost every occasion after she first broke that mark as a sophomore. Knight: "It might sound weird but I didn't know much about times. I didn't know what I was doing was either good or bad. When I stepped on the track, I just ran as fast as I could. The more I trained and the more I ran, breaking 24 was a really regular occurrence. "Once I broke 24 outdoors, I never ran over 24 seconds again. Indoors or out, I never really knew the difference. I never knew what breaking 24 seconds really meant. I just felt like so many people were fast around me. So then I was running 23 seconds, too." Knight won both the 60m and 200m at Simplot in 2006, hitting all-time marks in the process. Her 7.25 second time in the 60m still stands as the 7th fastest time in prep history -- it was a junior class record until a year later when Victoria Jordan broke it by a hundredth of a second -- and her 23.26 in the 200m is eighth all-time. It should be noted that Knight didn't even win her 60m race as a senior. That honor instead went to Mt. Pleasant's (CA) Jeneba Tarmoh, who shocked the crowd with a win in 7.26 seconds. For most athletes, losses are brutal, and they often light the kind of fires that burn for years to come. But Knight wasn't even that mad. Knight: "To be very honest, I knew what my strengths and weaknesses were. I knew I struggled getting out of the blocks." Instead, Knight changed gears. She shifted that focus internally on the 200m, where she would see Tarmoh once again. When she lined up for the race, Knight was given Lane 5, an ideal position. Ebony Collins was in Lane 6, while Tarmoh was in 4. Knight: "I told myself, 'This is my race. I won't let anyone beat me.' It was almost the same lineup as what was in the 60m. I was like, 'OK, let's just get to the finish line first.'" Knight doesn't really remember that much from the race. It was a blur. Knight: "I just ran until I died. There was no strategy. What helped was Knight's endurance from the 400m. She had previously split 54 seconds outdoors, so instead of pulling up at the line, she powered through it. "I knew 22.9 was fast, but I wasn't quite sure. Then they told me Allyson Felix had run 23.06 before and that was the previous national record, and I was like, 'Dang, I ran faster than anybody had ever run indoors.' I was happy about it, but it took awhile. "It wasn't until I was home that I realized what I had done. I set a national record. Oh cool!" A few media outlets wrote about Knight's breathtaking performance, but that's about it. Knight: "I remember Simplot wrote something and headlined it 'Golden Knight.' I thought that was cool." Knight had won Gatorade Athlete of the Year in Mississippi the previous spring for her efforts on the track, but little was made of her national record en route back to her home state. Knight walked the halls as a national record holder, unknown to most of her classmates. Knight: "Everyone knew I was fast and good. But in Mississippi ...it's just that no one really cared. I guess it kept me humble, because no one over reacted." Knight went on to win a gold medal in the 200m at the Pan American Junior Games in Sao Paulo, Brazil, following her graduation from Ridgeland in 2007. Ridgeland High School has a trophy case with some of Knight's best performances and awards, including her Gatorade trophy. 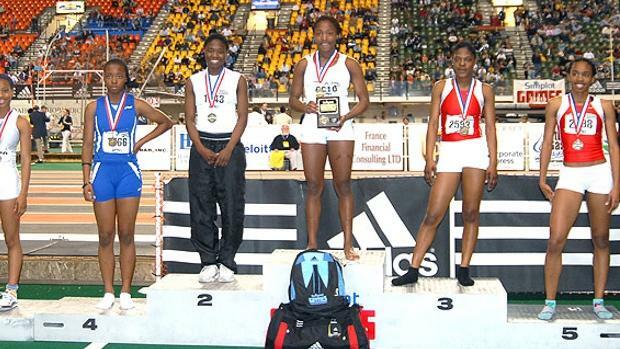 The sprinter also contributed to two team state championships during her time there, and racked up over 30 individual and relay titles along the way. Knight says she's given the high school a few hallmarks of her international accomplishments. Last year, Ridgeland High School debuted The Bianca Knight Invitational. Knight wasn't able to attend the inaugural event because she was pregnant, but she says she hopes to attend it in future years.